Stinger: This is the worst stinger of the whole Mediterranean, in terms of number of stung people. Thestings can be very painful and can leave scars on the skin. The effects can persist even for a relatively long time. 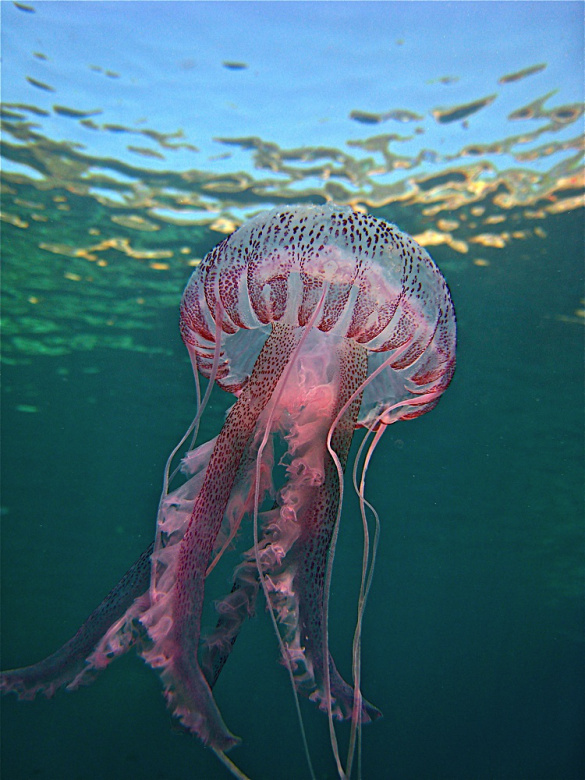 Most jellyfish stings in the western Mediterranean are from this species. Habitat: In the early Eaigties, Pelagia was abundant throughout the Meditteranean Sea, then it disappeared to reappear at more or less decadal intervals but, since the very hot 2003, its presence is rather constant in the western Mediterranean. In the summer, it can be present in persistent swarms that can spoil the tourist season even for months. How to Identify It: The umbrella is about 10cm in diameter, and is armed with 8 long tentacles that, when extended, can reach also 10m lench. The mouth has four long oral arms, the color of the whole animal is mauve. Hence the name: mauve stinger. The swarms can be very thick and if they invade a cage aquaculture plant, the effect can be devastating. Since the jellyfish can eat also the eggs and larvae of fish, the impact on fish stocks, and then on fisheries, can be equally devastating. They can also enter the cooling systems of plower plants, and block it.